Pressure-cooking is a food preparation method that uses trapped steam. The food is sealed inside of a vessel with liquid, heat is used to create steam, and this increases pressure inside the vessel. The appliance traps or releases steam to control the level of pressure within the unit. With the added pressure, the boiling point rises and allows the food to cook faster at a higher temperature. Pressure-cooking retains the flavor and nutrients of your food while saving you energy in the process. Pressure-cooking is not a new technique and has been around for over 350 years. Home pressure-cooking became popular in 1938 when it debuted at a Trade Show in New York. Electric pressure cookers have increased in popularity over the last several years. There are currently several brands of electric pressure cookers available. Some of the most popular brands include: Instant Pot, Crock-Pot, Breville, Black & Decker, Cuisinart, GoWISE, Power Pressure Cooker, and the most recent Ninja Foodi. You can find a comparison of a few brands by Utah State Extension. Did you find yourself with one of these as a Christmas present? Intimidated by the appliance and don’t know where to start? Here are a few tips and tricks to keep in mind as you begin to use your electric pressure-cooker. Use ½ to 1 cup liquid in the inner pot when pressure-cooking. When you pressure cook you need to have at least ½ to 1 cup of liquid in the inner pot. The liquid is needed to pressurize the unit. Too much liquid will cause the unit to take longer to get up to pressure and to release the pressure when cooking is finished. Use multiple buttons in a cooking session. Cooking for the whole meal can be done in the same inner pot. You can use the Sauté button to brown the meat or cook onions or garlic. Then, add your ingredients and set to pressure cook. Once it’s done, use the Keep Warm button to keep the food warm until the whole family is ready to eat. Add about 10-20 minutes to listed cooking time. When you are pressure cooking the unit takes about 10 minutes to come to pressure. Therefore, if your recipe calls for 30 minutes at High Pressure cooking time, then your total time will be 40 minutes. You may even need to add time to the end of cooking to de-pressurizing the unit. Depending on the unit and the item you are cooking, de-pressurizing could take anywhere from 5-20 additional minutes. The lid of the pressure cooker contains a silicone-sealing ring and it can deform over time. Get into the habit to check it every time. It is recommended to replace the sealing ring every 18-24 months or when you notice cracks or other deformations. Don’t forget to check your vents to make sure they are clean and clear of food clogs. Please keep in mind that an electric pressure cooker is different from a pressure canner. A pressure cooker is not a pressure canner and should NEVER be used for canning. Kendle, C. (2018, January 30). Electric Multi Cooker Tips and Tricks. Did you know that November 15th is National Clean out Your Refrigerator Day? Seems like there is a day for almost everything anymore, but this one does come at a good time! Many of us will soon be filling our refrigerators and freezers with more food than usual as the holidays approach so it is the perfect time to take a good look inside. The first step may be to decide what is safe to keep or what you should toss. Here is a quiz that might help you get started. Also, Ohio State University Extension provides information on safe refrigerator and freezer storage on Ohioline. Many people do not realize the dangers involved in eating food that has been kept too long or stored in a refrigerator or freezer that is not kept at a safe temperature – under 40⁰ for the refrigerator and under 0⁰ for the freezer. Remember, when in doubt, throw it out! Never taste food that looks or smells strange. There could be bacteria that are not visible to the human eye, but they could cause food poisoning. Once you have decided what needs to be thrown out, you can start cleaning! Any old or spoiled food should be discarded. Take out shelves, drawers, etc. and wash with hot soapy water, rinse, and dry. Wipe out the inside of the refrigerator – don’t forget the door seals. Some recommend using a mixture of 2 TBS. baking soda/1 qt. hot water. Wipe off jars and containers as you return them to the refrigerator. Check the interior temperature to be sure that it is below 40⁰. Dust and wipe the exterior of the refrigerator. Now that your refrigerator is sparkling clean, make it a habit to wipe up any spills as they occur to keep it fresh and clean. This might be a good time to invest in new refrigerator and freezer thermometers. Keep it in the body of the refrigerator – not on the door. Get into the habit of storing your food and leftovers properly. Securely wrap foods or store in airtight containers. Check expiration dates on products – remember that once you open them, the expiration date on the item is no longer effective! In that case, follow the safe food storage charts mentioned above. Don’t Believe the 5-Second Rule! Do you follow the “5-second rule” when you drop food on the floor? If you do, you may want to rethink your actions. include moisture, type of surface, and contact time. It was found in some instances the bacteria began to transfer in less than one second. Time to rethink the idea that you can pick up any food off the floor quickly, and it is safe to eat. Each of the surfaces were contaminated an Enterobacter aerogenes, “cousin” of Salmonella. The bacteria were allowed to dry before food was dropped. The researchers replicated the scenarios 20 times each checking the bacteria transfer to food samples at less than one second, five, 30 and 300 seconds. Each food sample was then analyzed for contamination. Moisture seemed to increase the transfer of bacteria to food the most. Watermelon contained the most contamination while gummy candy contained the least. The longer the food was on the contaminated surface the more bacteria it contained. However, contamination from bacteria can occur instantly. Surprisingly, carpet had low transfer rates. Tile and stainless steel had higher transfer rates than wood which was variable. Another study with tile found E. coli was transferred to gummy candy in less than 5 seconds with more bacteria transferred from smooth tile than rough tile. Next time, you drop some food on the floor you may want to think twice before you put it in your mouth. Any food that has been on the floor may contain bacteria which may make you sick. Is the food that important or expensive? Would you be better off throwing it away? It is always better to avoid infection or being sick. Are you starting to see these markets opening up in your area? Farmers’ markets are a great place to get locally-grown vegetables, fruits, and other foods for you and your family. As more and more locations open each year, it is important to follow basic food safety guidelines to ensure that the fresh food you are buying is safe. Many markets have their own food safety rules, and vendors must comply with them, as well as any applicable government regulations. However, it is a good idea to remember to use the guidelines. Make sure that eggs are properly chilled. The FDA requires that untreated shell eggs must be stored and displayed at 45 degrees Fahrenheit. Following these simple steps will help you keep your food and your family safe while supporting local growers in your area. As always, start with clean hands and a clean surface as you prep your meal. To avoid sticking and provide a speedy clean-up, spray the inside of the crock with non-stick spray before adding ingredients. Thaw frozen meats before adding to the crock either in the microwave or refrigerator. If you decide to cut up foods ahead of time, store meats and vegetables separate before placing them in the pot to avoid growth of bacteria. To shorten the time that foods are in the danger zone, between 40 and 140 degrees, either pre-heat the cooker or use the high setting for the first hour. I often add one of my liquid ingredients and turn my pot on high as I prep the other ingredients to add. Surprisingly vegetables cook slower than meats, so add them first. 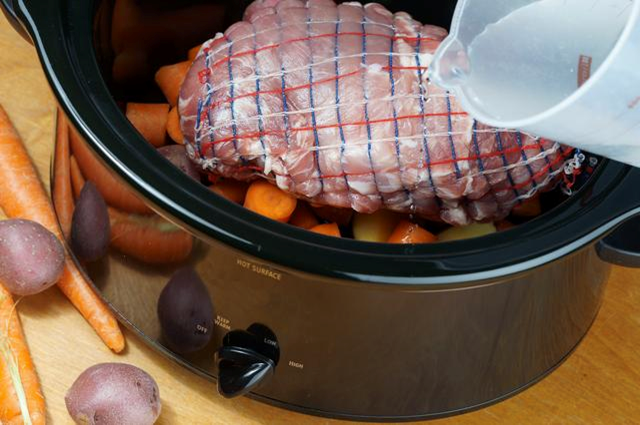 Newer research states that larger cuts of meat can be now cooked in a slow cooker, but check manufacturer directions to see how many pounds your machine will hold safely. Check large cuts of meat with a meat thermometer to ensure safe temperature, 165 degrees for poultry and ground meats; and 145 to 160 degrees for beef, pork and lamb. When cooking meats and poultry water, broth, or vegetable juices should almost cover the meat. This liquid provides more even heat transfer and creates the steam to ensure safe cooking. While it is tempting, do not over-fill slow cookers. A pot one-half to two-thirds full is a full pot for cooking. Do not remove the lid unnecessarily. When you lift the lid the inside temperature drops and can add 30 minutes or more to the cooking time. After serving foods do not leave them to cool down in the crock. Store slow cooker foods safely as other left-overs – separate into shallow containers within short time and store in refrigerator or freezer. Left-overs should be reheated to 165 degrees before eating. Are you looking for a low cost slow cooker meal idea? Try one from our Ohio State University Extension, Wayne County http://go.osu.edu/slowcooker. What is your favorite slow cooker recipe? I love my mother’s baked beans, white chicken chili, and anything for a tail-gate. Comment on your favorite. USDA, Food Safety and Inspection Service, “Slow Cookers and Food Safety”, http://www.fsis.usda.gov. University of Minnesota Extension, “Slow Cookers and Food Safety”, http://www.extension.umn.edu/food/food-safety/preserving/safe-meals/slow-cooker-safety/.